I try to go with an open mind into any movie I see; how can you really judge a movie without watching it first? Despite that though I do catch myself disregarding movies, because of the first impressions of the plot or the actor. I had that here with 17 Again: a starring vehicle for the new Disney poster child Zac Efron, with a Freaky Friday twist? Nah, not for me. And yet surprisingly it was. In 1989, Mike O’Donnell (Zac Efron) is the star of his high school basketball team, with a bright future and a college scholarship almost in his grasp. He throws it all away though when he finds out his girlfriend Scarlet is pregnant and asks her to marry him. 20 years later Mike’s (now Matthew Perry) life is falling apart: his marriage to Scarlet is on the brink of a divorce, he’s got no real relationship with his teenage kids and he’s living with his high school nerd-turned-billionaire best friend Ned. But Mike gets a second chance when he is magically transformed to 17 again. The age transformation gimmick has been rehashed so many times in Hollywood: kids wanting to be older, adults wanting to be young again, we’ve seen it all before. Freaky Friday. Big. And now 17 Again. Add to that plot lines borrowed from other ‘teen’ movies, like the Back To The Future “must not attract the family member” and you’ve got a movie that reeks of unoriginality. Regardless of that though, 17 Again is a funny and entertaining teen movie. As much as I hate to admit it, that mainly comes because of the likability of Zac Efron. In all previous movies I’ve seen with him, he comes off as a little too charming, a little too smug; I never got why so many teenage girls were so hysterical about him. But with 17 Again his charisma carries the entire movie. Zac Efron just charms the socks off of you and you can’t help but like him. The rest of the supporting cast are great too. While Matthew Perry doesn’t get that much screen time, it’s his performance at the start of the movie that makes you begin to care for the character of Mike. Most scenes with Mike’s best friend Ned are hilarious: he has the best pop culture one-liners, his entire house is full of geeky memorabilia, his wardrobe is outrageous and his antics to woo the high school headmistress are awkwardly funny. There’s a brilliant scene at the start of the movie where Ned and Mike have fight with Ned’s Lord of the Rings and Star Wars props. Leslie Mann is great as Scarlet, although she doesn’t get as much comedy time as we’ve seen from her in previous movies. The only drawback I had with 17 Again is it’s wrap-up. After the predictable reveal, the movie ends pretty quickly, giving almost no screentime to the stories of the other characters. 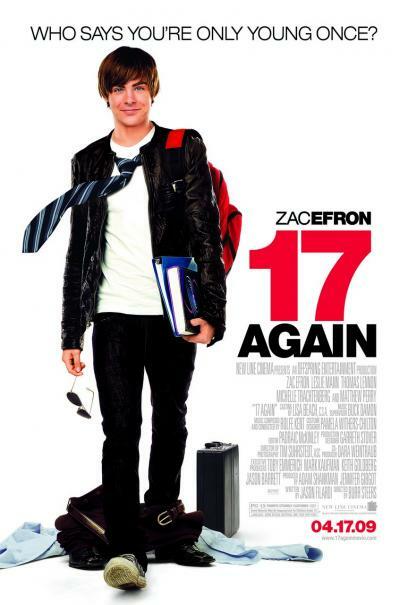 17 Again is a light funny movie, which deserves a wider audience than just hysterical Zac Efron devotees. Yes, teenage girls are going to love it, but there’s more in this movie that will attract others too. I was expecting a movie I’d hate, but instead I discovered I actually did enjoy it. 17 Again never reaches the heights of teen classics, like Mean Girls or Clueless, but it’s an entertaining 102 minutes and well worth paying a cinema ticket for.